Enjoy the many scenic drives in the Royal Gorge Region. From the river, to history, to mountain drives, come and see everything this amazing area has to offer. Drive your passenger car on a road that ascends and follows the top of a high razorback ridge overlooking Cañon City. Once you enter this one-way, paved road from Highway 50 on the western edge of town, the landscape falls away hundreds of feet on both sides, which is just a bit hair-raising! As the Arkansas River Valley spreads out around you, look for one of the many pullouts to enjoy the view. Towards the top, there’s an interpretive display to help you see — can you believe it? — dinosaur tracks embedded in the cliff face. North of Florence and part of the Gold Belt National Scenic Byway is Phantom Road, a twisty drive through a canyon with green-spotted walls. Located on top of what was once the Florence and Cripple Creek Railroad, the “phantom” is rumored to be the ghost of a man wearing a prison uniform who walks along the tracks. This backroad to the Royal Gorge is gravel and not marked very well, but it will reward you with incredible views and give you a true look at the flora and fauna of the area. You can start at the back entrance to the Royal Gorge or go on around to Parkdale on Highway 50. 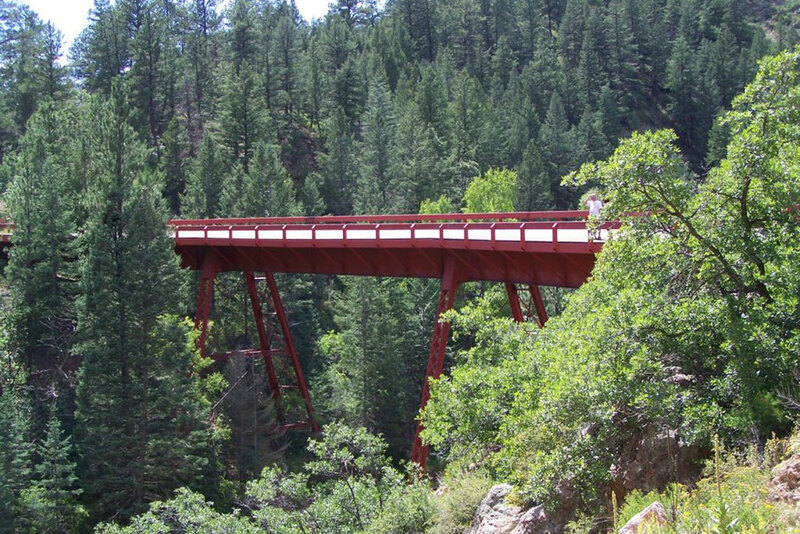 Ride the Oak Creek Grade Road for a tour through Silver Cliff, Westcliffe and western Fremont County. This loop drive takes you into the most beautiful scenery in the world. The road enters the Wet Mountain Valley east of Silver Cliff and continues into Westcliffe for spectacular views of the Sangre de Cristo mountain range. Take Highway 69 to Texas Creek and back into Fremont County. From Cañon City, drive southeast to Florence on Highway 115. On the way, turn off at Williamsburg/Rockvale/Coal Creek. You’ll come across old coal camps, which are now quiet but hold some of the most interesting histories in the county. A drive along Highway 50 west of Cañon City takes you through Bighorn Sheep Canyon and along the beautiful Arkansas River. There are several areas along the river to relax, watch the rafters go by and enjoy a picnic lunch. This area is also a great place to see wildlife. Continue up the canyon to Salida and then head back to Cañon City. The Gold Belt National Scenic Byway retraces the historic travel routes connecting Cripple Creek and the Victor Mining District — site of the world’s largest gold rush — and the communities of Florence, Cañon City and Florissant. This scenic byway invites you to experience the rich, local heritage as you follow the “Roads to Riches.” You can reach the northern end of the byway from Highway 24 and the southern end via Highway 50. The roads offer distinct scenery ranging from rolling, mountain parklands to deep, rocky canyons. Along the way, each community showcases unique character and convenient services that include a variety of restaurants, lodging, shops, entertainment and events.